Benjamin Robert Haydon, “John Keats” (c. 1846). Pen and brown ink on wove paper. 9 1/8 x 7 3/8in. (23.2 x 18.7cm). 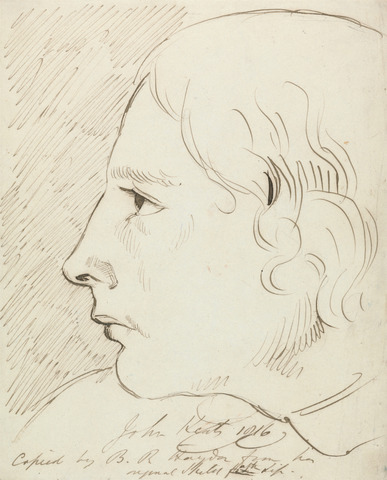 Signed, dated and inscribed, in pen and brown ink, LC: John Keats 1816/ copied by B.R. Haydon from his/ original sketch. Yale Center for British Art, Paul Mellon Collection. B1977.14.4160. Friends and followers of The 18th-Century Common will likely want to read Professor Eric G. Wilson’s recent essay, entitled “Poetry Makes You Weird,” published earlier this week on the website of The Chronicle of Higher Education. Wilson’s piece reminds us of what happens with the convergence of poetry and nature and especially the “weird” but wonderful ways in which poetry (with all of its cherished oddities) possesses a unique ability to unlock the familiar and make it uncannily alive and rich and strange. Andrew Burkett is Associate Professor of English at Union College, where he specializes in British Romanticism. He is Co-Editor of The 18th-Century Common and is the author of Romantic Mediations: Media Theory and British Romanticism (SUNY Press, 2016).